Music is the map of the Jewish spirit, tracked across centuries, illuminating our prayers and supporting us in joy and sorrow. Never has music been more essential than it is in our time. That’s why we, the New York Cantors, want to take our PBS concert on a live tour across the U.S.! 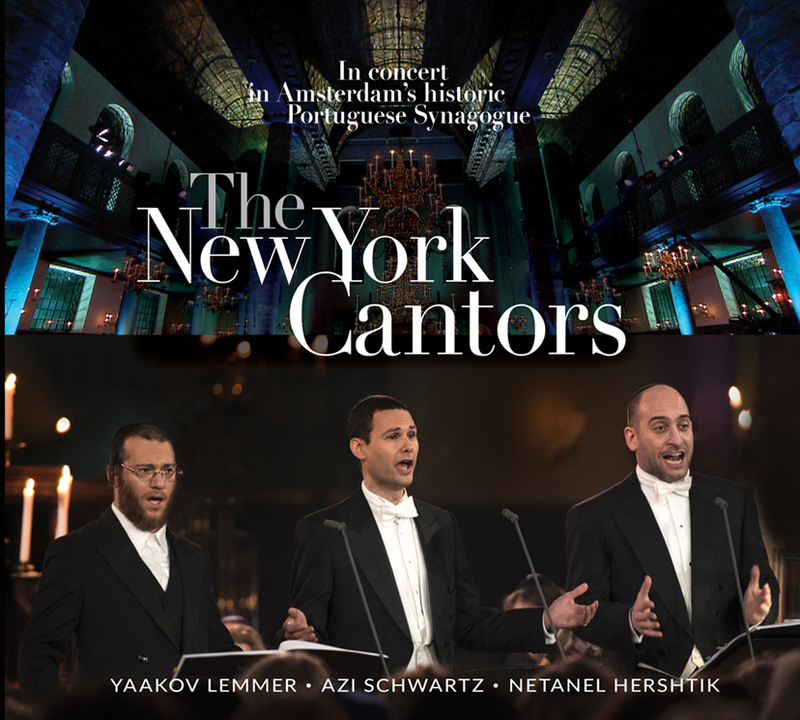 Yaakov Lemmer, Azi Schwartz and Netanel Hershtik are accomplished, new-generation cantors all serving synagogues in New York and dedicated to preserving, supporting and bringing Jewish music to a wider audience. Yanky, Azi and Netanel see their concerts, touring, and television appearances as an extension of their work in their synagogues, part of their life-long commitment to being messengers of the ancient prayers, and explorers of the rich musical traditions in Jewish culture. 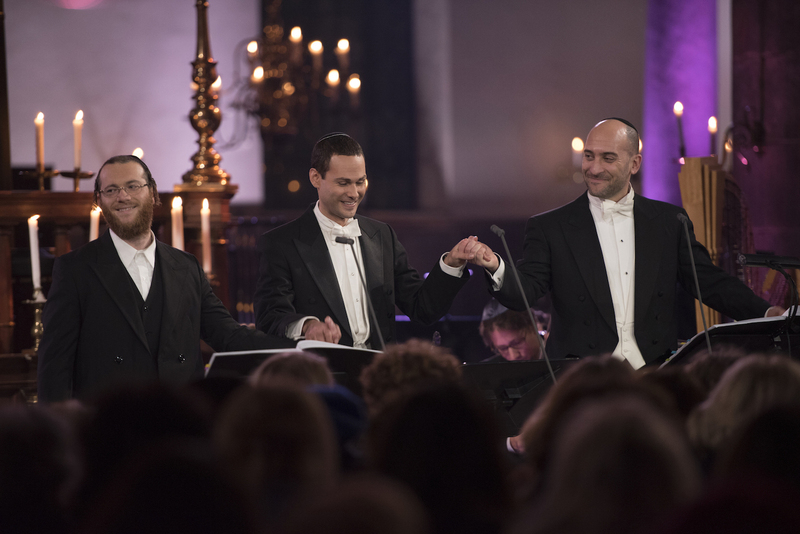 Brought together by U.S. public television for a recording in Amsterdam’s ancient Portuguese Synagogue, The New York Cantors TV concert has been seen by well over a million Americans since it premiered on PBS in March 2018. With its compelling mix of sacred and secular Jewish music and beautiful new arrangements for orchestra and chorus, the PBS TV concert has become an instant classic. In total, 270 telecasts were offered in March by 181 of the PBS stations, in 94 TV markets, and 31 states. Yanky, Azi and Netanel are keen to tour a live version of their PBS concert. Fans of the PBS program are equally keen to experience it live. But staging concerts with a 16-piece orchestra, and four-voice chorus is an undertaking with a lot of expensive moving parts. The only way to build a healthy and long-running touring operation for concerts of this quality is to find investors, sponsors, and passionate fans of our music to pitch in and support it up-front. So here is where you come in. We need you to join us in bringing the power of music to our communities all over the United States. By supporting this inspiring touring project you will become a Friend of the The New York Cantors. Depending on your donation level, this means access to our music, DVD, concerts, meet and greets, and of course, getting to tell all your friends and family that you are friends with The New York Cantors (at least, we think that’s pretty awesome ;)). Venues: We will spend at least half of our funding to subsidize the basic cost of staging the concert in synagogues and concert venues in U.S. cities. This will enable us to reduce the “guarantee” presenters would normally need to pay to cover the basics. Which will make their risk much more acceptable— and concerts more likely. Seed Money: Since we will be assuming some of the presenters’ risk, we will be asking to earn a percentage on ticket sales after expenses. Those profits, when they occur, will be used to subsidize more concerts and reach more fans of the music. In this way the $125,000 we seek to raise is the seed money that will eventually make touring self-sustaining. 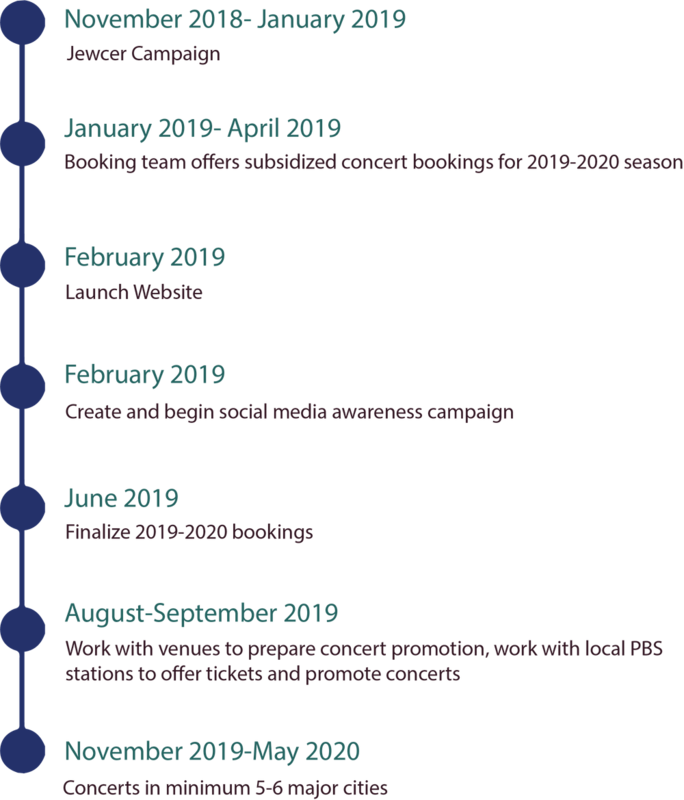 Outreach: We will invest heavily in social media outreach as well as traditional publicity to create national awareness and engagement with The New York Cantors, building on their introduction by PBS. We will promote concerts locally through advertising, posters, and outreach to local Jewish communities. Marketing: We will create a much-needed website that showcases our incredibly gifted cantors and the music they love to sing. And serve as the information hub and meeting place for Friends of the The New York Cantors to meet each other and keep in touch. Marketing and PR is expensive any way you slice it. But we will spend wisely and always with the end goal of bringing this unique concert experience to as many communities as possible. If you’ve read this far you already know that we are three cantors completely into Chazzanut, Yiddish folk, and other “music of memory.” I’m Brooklyn born-and-raised and started my career as soloist of the Young Israel of Beth El Choir, where I was extremely lucky to have been chosen for private lessons by the great Cantor Ben Zion Miller. I later studied at Yeshiva University with Joseph Malovany and Bernard Beer. Additionally, I later studied with legendary Cantor Noach Schall. While I am honored to be invited to sing in concert halls and synagogues all around the world as a solo artist, and also sometimes with my Grammy award winning Jazz/Klez friend Frank London, this project with Azi and Netanel is very special to me. I hope you will consider joining and contributing as a Friend of The New York Cantors and that we’ll meet at some future concert, made possible by your help. Yanky, Netanel and I are all fortunate that the synagogues we serve are not only incredibly supportive of the work we do in our own congregations but also generously encourage us to pursue our mission of musical and spiritual outreach to the larger community. We want to help individuals tap into their emotional connection with Judaism through this music. 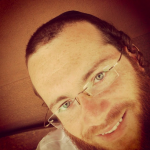 I grew up in a traditional community in Israel. My grandfather, also a cantor, inspired me to pursue my passion for singing and music. After graduating from Tel Aviv Cantorial Institute I continued studying music with a Masters in Classical Singing and Conducting from Mannes School of Music. This journey brought me to New York where I lead the Park Avenue Synagogue community and express my love of bringing Jewish liturgy to the broader world. With your help we can share our ancient tradition even further, in a way that is dynamic, powerful and alive. 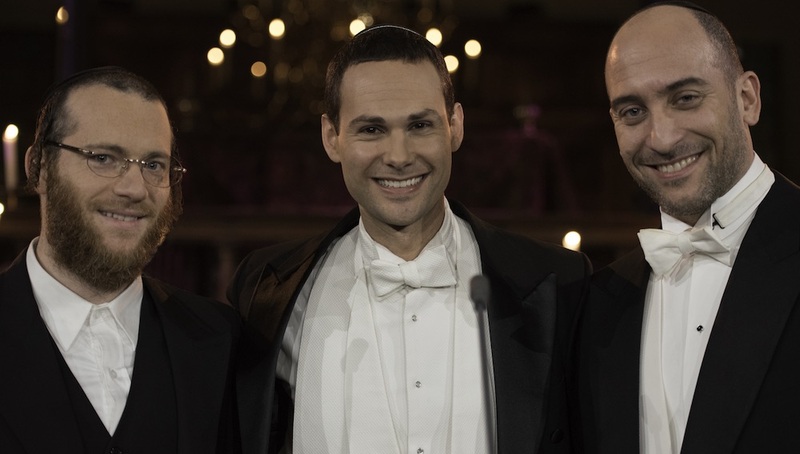 Although we are all well along in our cantorial careers, and perform regularly around the world, Yanky, Azi and I feel a bit like we won the lottery in being asked by PBS to perform together for the TV concert recorded in Amsterdam. It was a dream project, working with a wonderful Dutch orchestra and the amazing composer and arranger Bob Zimmerman, who breathed new life into some very familiar songs. My musical life started at age seven, singing alongside my father, Chief Cantor at the Jerusalem Great Synagogue. I graduated from the Tel Aviv Cantorial Institute and also studied with renowned cantors Chayim Feifel, and Raymond Goldstein. Coming from 16 generations of cantors in my family, I know the importance and joy in keeping the Jewish musical tradition alive. Please support us in taking The New York Cantors on the road, across the U.S. The New York Cantors’ producer is Daniel Hart, veteran creator of PBS concerts for television. Our beloved touring guru is Moishe Rosenfeld, whose New York-based Goldenland Concerts books and manages our touring. (www.goldenland.com ) Maestro Andrew Kurtz, Music Director and Conductor of the Gulf Coast Symphony, Ft. Myers, Florida, is our Tour Conductor. 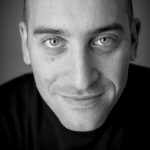 And pianist, recording artist and Grammy-winning composer Michael Whalen is our digital/social media marketing and production advisor. Help us use music as a healing power of our heritage, as a way to understand who we are, and to provide hope and comfort to our troubled world. Together we can watch, listen, and sing for a better tomorrow. "Best of luck in spreading your singing throughout the land, as I love hazzanut!" "לע"נ חנה לאה בת משה צבי"
"In honor of all my grandchildren and great granchildren in Eretz Yisroel"
"To help more people get to enjoy these wonderful voices." "Happy to help these outstanding Cantors and my friend Netanel." "Heard the show is amazing!" "Loved the show! So glad it is going on the road!" "In Honor Of Carol & Jerry Levin"
"Looking forward to seeing the Cantors in person!" 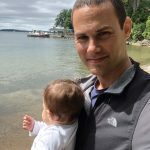 Yaakov (Yanky) Lemmer is cantor of the Lincoln Square Synagogue in New York City; Azi Schwartz, a native of Israel, cantor at New York’s Park Avenue Synagogue; and Netanel Hershtik, also Israeil-born serves as cantor at The Hampton Synagogue, Westhampton Beach, New York. Like getting coffee for you and a friend, we are so grateful for the choice you've made to take the time out of your day and support our Jewish mission of bringing us together through the power of music! You get a choice of three free digital song downloads from The New YorkCantors CD! Thank you for joining us as we gather together to make a difference in Jewish communities around America. You get a choice of 5 free digital song downloads from The New York Cantors CD! Hit-the-bars kind of Friend, you rock!